maxxTORQUE: Diesel Timing Your Cooling System? With a powerplant that only operates at 35% efficiency, losing three percent to diesel timing issues – a common occurrence – represents nearly 10% of available output... that is BIG. By itself, that three percent can reduce the speed of your truck on an extended grade enough so that the cooling system no longer receives sufficient air to fulfill the heat load rejection requirements of the cooling stack. On the other hand, gaining that three percent with optimum diesel timing can not only mean maintaining the power and speed that your truck needs to keep the cool air flowing... it can also mean that your engine actually sends less heat into the cooling system. I have a confession to make: I am not a big fan of dynos. Torque curves on paper don’t excite me that much. Instead, I like to see a truck’s work performance in the real world. A vehicle that has been tested with a 15,000-pound trailer was not meant to be confined to a gerbil cage flexing its quadrupeds. If you were to extend that five-second WOT power level for two minutes, those curves would erode: a 300 HP truck optimized in a cool garage for those five seconds will often lose 25 to 75 HP on an sustained desert grade. The bad news – but news that we have learned to live with in the world of internal combustion – is that if an engine has a final rated output of 300 HP, it sheds nearly the same amount of power (an additional 200 to 300 HP!) through the cylinder walls and heads. This is the dilemma faced by all internal combustions engines: the cooling system must be present to handle the waste heat produced by the engine, but it does so by removing power in the form of heat energy, power that could be driving down the piston, creating torque and, ultimately, turning the wheels. This fact is part of why all internal combustion diesel engines have such terrible overall efficiency – rarely higher than 35%. As we move forward in this article and discuss diesel timing issues and their affect on power production and on the cooling system, do your best to view the cooling system as a necessary evil: the less power that we end up feeding the cooling system through the engine, the more power left to produce actual work. Such positive adjustments can be realized through injection timing... as we shall see. One more note before moving on. In the Spring 2009 issue of maxxTORQUE, I wrote more broadly on “Timing the Diesel”. If you have not read that article, it won’t hurt to do so. This current article narrows the application of diesel timing discussed in that article to high load scenarios. 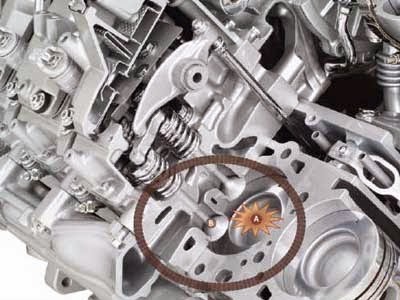 When ignition occurs, whether in spark ignition or the auto ignition of the diesel, the torque stroke is the main area of interest and the processes that occur in it separate an efficient motor from an inefficient one, an over cooled motor from an under cooled motor. The power that arrives at the wheels is defined as the fraction of fuel that actually converts to work, compared to the power that becomes waste heat. The waste heat, the bulk of the burned fuel energy, is defined as: one minus efficiency. In other words, if only 35% of the fuel is turning the wheels, the other 65% (1 – .35) is, we say, wasted. And how is it wasted? By being removed via the cooling system or escaping out the exhaust valve as unused heat energy and disappearing out the tailpipe of your vehicle. The cooling system, that necessary evil, is essential to maintaining an equilibrium over a wide range of operating conditions and temperatures -- yet it does so by wasting a lot of heat energy. And this is where the relationship between the cooling system and injection timing enters our story. Following ignition, temperatures that had reached 1,100ºF under the effects of compression literally explode to 4,000ºF at the center of a temperature gradient inside the cylinder. This explosion results from potential energy, that had been stored as chemical energy in the diesel fuel, being converted to heat energy. The gases in the cylinder absorb this heat. It is during this period of time that the highest temperatures are reached inside the cylinder. It is true that the pistons do not actually see those 4,000ºF temperatures (the highest temperatures occur at the center of the gradient within the cylinder gases themselves) but it is also true that the highest temperatures that the heads and cylinder walls will see occur before any torque has been produced -- and already our necessary evil is off-loading the heat energy that could be spent on torque production into the coolant. The amount of work performed on the piston. These factors affect how much of that heat energy gets converted to torque and how much disappears via conduction through the pistons or via convection out the exhaust valve. If we can influence diesel ignition timing – and we can – then there is hope to minimize the negative affects of the cooling system on torque production. We are also able to decrease the amount of heat sent to the cooling system. This is particularly significant for those times when the heat produced by the engine might otherwise exceed its heat rejection capacity. More on using improved diesel timing to avoid overheats later. Let’s look at increasing engine efficiency first. Cylinder heat soak also plays a role in determining the rate at which evaporation (and combustion) proceeds. Of course, all of these variables are moot factors if we do not inject fuel into the cylinder. We are able, then, to determine the most important start-of-ignition variable: the start-of-injection timing point. As an example, if we use early advance timing, say 20 degrees before top dead center (BTDC) the fuel injected into the cylinder has more time to evaporate to a point where ignition is possible before maximum pressure, which occurs at top dead center (TDC), is reached. As a result, ignition starts sooner. As I mentioned earlier, the decision where to set the start of injection is important from a cooling system perspective. As the piston makes its way around, approaching TDC, the temperatures quickly rocket to 4,000F once ignition has started. The cooling system will see this heat and it will start to remove some of it. As that heat is removed from the cylinder walls and head, the cylinder gases inside cool down and shrink: bad for the production of torque. This cool-down is unfortunate because we do not want to send heat into the coolant; at least, we want to avoid it as much as possible. We would prefer that all heat released in the cylinder could be converted to work but it is the nature of the beast: a non-ideal, relatively inefficient energy conversion mechanism. Two-thirds of the energy released at combustion runs out of the vehicle as waste heat, carried away from the cylinder by the coolant or as 1200ºF exhaust. About 35% efficiency is obtained under the best circumstances. The other 65% lost as heat is worthless to the task of turning the wheels. Another way to think of it, for every three gallons burned, only one gallon is turning the wheels, the other two go up in smoke. What we want to see, and the best we can hope for, is 4,000ºF, then a very quick expansion that forces the piston down. With this expansion, the temperature of the cylinder gases drops precipitously. If the peak temperature is reached before TDC, then heat is being off-loaded to the coolant before even one foot-pound of torque is produced. As far as the cooling system goes, the more time it is exposed to the high peak temperature, the more heat is going to be sucked out of torque production. It would be ideal if expansion occurred instantly, so that temperatures went from 4,000 to 200ºF, but that is not the case. In reality, it takes a finite amount of time, and during this time, heat migrates from the cylinder to the cooling system. If we set timing so that combustion occurs very late (retard), then more heat runs out of the exhaust, with more of the chemical expansion occurring after the piston has attained a high downward velocity. The combustion gas expansion effort is, in effect, chasing behind the piston and less work is performed on the crank. On the other hand, if we set the timing too early (advance) and another problem occurs. That 4000F occurs early, before TDC, perhaps well before. With the piston staying around the TDC zone longer with this hot, compressed gas, the cylinder is exposed to 4000F for perhaps up to twice as long. More heat transfer occurs to the surrounding cooling jacket. In other words, The amount of time that peak heat is exposed to the coolant is increased. Injection timing, then, is an important cooling system parameter. It helps to determine for how long hot combustion gases are exposed to the cooling system and this represents a significant part of the cooling system’s thermal load. The question next is what is worse, timing that is too advanced or too retarded? It is an important question because optimum diesel timing, with so many changing conditions, is often elusive: we should err toward caution instead of destruction. My opinion comes with an explanation and this part, at least, is subject to some debate. First, my response to the question: over advanced is worse. When diesel timing is advanced past optimum, even a little bit, significant torque is lost in the torque stroke. Partly because of the loss of additional heat to the cooling system but also because the cylinder pressure runs high before the piston reaches TDC, adding more negative torque into the total torque integration. These pressures are of extended duration and represent more stress to the motor in the long run. But the my main reason for holding that opinion is what happens when extended work occurs, towing as an example. Factors that come along with high workloads are factors that automatically advance ignition (not to be confused with injection timing). The heat soak nature of higher cylinder temperatures and factors like increased intake air temperature, change the ignition and combustion progression within the cylinder. Ignition begins sooner in the piston travel and then progresses with greater speed. This is not hard to picture. Anyone who has thrown a cup of gasoline on a hot log will know immediately that this is the case. Dry air does the same thing, speeds up combustion, which is why Arizona firefighters face such a challenge with brush fires. So a hotter, drier combustion environment leads to even higher timing advance complications, like reduced torque and higher cylinder pressures. The major symptom is power loss. One extreme example of this occurs during a workload overheat: anyone who has towed on grade to overheat can testify that power reduces to a fraction of normal. The noise of detonation can be heard prominently as the vehicles chugs to a near stop. This occurs because timing is advanced way past optimum for the cylinder conditions. Among other reasons that diesel timing is no longer optimum in the above high-load scenario, cylinder surface temperatures alone increase 200 to 300ºF after 30 seconds. If timing is not adjusted when these environmental factors advance ignition then MPG suffers, head pressures increase and speed on the grade decreases. And we all know that speed is essential to the cooling effort. These problems result mainly due to a loss of power. What’s my point? Don’t rely on tuning performed solely on a dynamometer. Dyno tuning may be fun and offer gratuitous value to gearheads as a torque/HP graph, but it has limited value; even less if you don’t have a spare magnet on the fridge. For these periods of extended work load, you will not arrive at an optimum tune for your truck in the dyno alone. Why? Because tunes based on a snapshot of your truck’s performance do not take into account real world work loads and the effect they have on your engine over extended periods. EGT is typically monitored to protect a turbocharger from excess heat. This often travels with misconceptions tagging along. In my opinion, EGT cannot be used to predict thermal loads and cooling performance; it represents a waste gas condition, nothing more or less. It is not a predictor of melting pistons or motor longevity. It is a poor way to determine engine shutdown for turbocharger oil coking protection, namely because EGT and oil have nothing directly in common. It is also important to understand that EGT and ECT are not synonymous. An increase in EGT does not necessarily suggest or predict added cooling system loads. How could it? EGT is measured external to any cooled component. From the discussion above, it is clearly possible to reduce ECT, even when an increase in EGT has been observed. For example, retarding the timing from an over advanced condition will mildly increase EGT as well as restore optimum torque, not to mention better MPG, higher towing speed and cooling, meaning lower ECT. Yes, but not for reasons many worry about. From my point of view as someone who focuses on increasing thermodynamic motor efficiency, I want to see more of the fuel combustion spent on expansion and torque and less wasted as exhaust. From that perspective, the only numbers that are important are the peak temperature of the combustion charge and the temperature of the exhaust exiting the exhaust valve. That’s it: the larger the difference between these two, the more effectively power is being produced and the higher the efficiency. So yes, low EGT is better but advancing diesel timing to accomplish this does not accomplish anything positive. It usually adds negative torque (see my Spring ‘09 Timing article). Additionally, it is potentially dangerous to head pressures. Instead, adjust diesel timing to maximize torque and let the turbo take care of itself. Optimized timing automatically reduces exhaust gas exit temperatures to the lowest temperatures that still prevent torque erosion. It is built into the fancy heat release model and it works. Better yet, if EGT really concerns you (and I agree it is something to watch, for the sake of the turbine), find a hardware method of reducing it. I like exhaust modifications: attention to IAT and cold air intakes, water injection, pilot injection, even boost management; just a few ideas. Any time these methods are employed to reduce EGT, a commensurate power (and speed) increase is observed. Win-win. Water injection even has big benefits to the environment in the form of large particulate NOx emissions reduction, especially in arid climates. Win-win-win. Diesel ignition timing is efficiency and it is every bit as much a cooling system parameter as is the composition of the coolant or the speed of the fan. Optimize diesel timing for all conditions, and improve the max load capabilities of your work vehicle.